What started in 1998 as a small club among friends who were obsessed with modifying and racing their classic European cars, has now grown into one of the largest and most unique private enthusiasts clubs anywhere. Fuelfed was founded on the spirit of driving and mechanical connectivity and has built itself with members who believe in this same ethos. Fuelfed focuses on driving, socializing and promoting the passion of classic European automotive ownership. As a diverse group of focused enthusiasts, we each take pride in our own choice of marque, yet as a collective group, we all share the same passion. For us, it has always been about WHY WE DRIVE, NOT WHAT. As most drivers know, as the originators, Fuelfed is far more than our nationally trademarked Coffee & Classics® gatherings on Sunday mornings. There are innovative driving and social events: Spontaneous Combustion, Fuelfed Fall Classic couples weekend, TFD series, The OPEN series, Cocktails & Classics, W3, MotorGearo 250, the holiday party, winter Swap Meet, etc. There is something for everyone. Fuelfed has also taken the lead in exposing the next generation of automotive enthusiasts to the classic car lifestyle. We support mechanical stewardship and the local organizations that sponsor young technicians. If you’re a discerning European car collector or enthusiast that enjoys the diverse camaraderie that no other single marque club can offer, please take a few moments to read further down. Membership is per calendar year Jan.1 to Dec.31. Shortcut to Existing Member Renewal. There are three levels of memberships, each serving a different interest and need of our membership. Fuelfed’s main focus is on Classic European cars and a unique motoring agenda to better enhance their ownership. Enthusiasts with Modern European cars now have options for participating in activities with our new Modern European membership. If you’re a classic European car fan looking to get into the scene, but don’t have a car yet, you can join as an Enthusiast. Why can’t owners of American and Asian cars join? Sorry, there are plenty of venues for those interests. Fuelfed is not trying to be a club for everyone. Classic European – Drive a pre-1990 European classic car OR were a paid member prior to 2015 – $45 annually. Modern European – Drive a 1990-present European car – $35 annually. Enthusiast – European car enthusiast without a qualifying car – $25 annually. All members receive a FF membership card, FF magnet, and invites to non-driving events. Hang tags and name badges are optional. 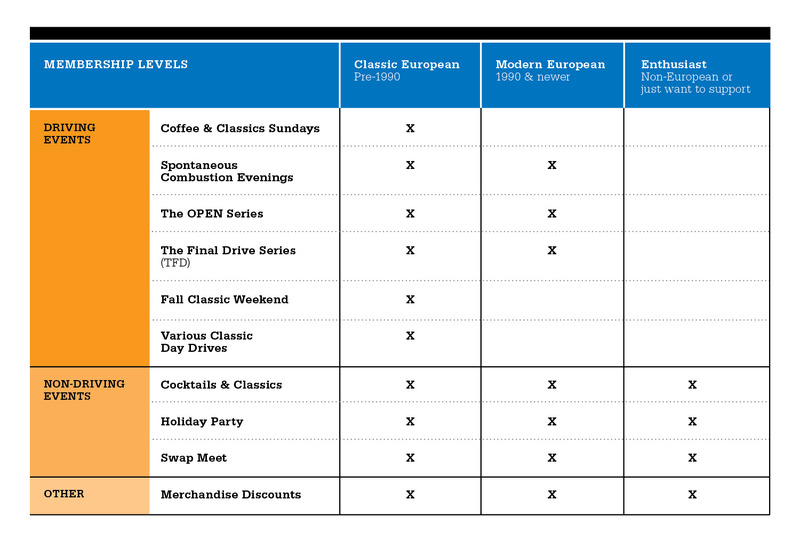 Driving event eligibility varies by membership type. Click chart below for details. Membership applications are reviewed by the membership steering committee. Once approved, you will be emailed a payment link. If you were approved in 2017 but did not follow through on payment, you need to reapply. Please visit the Membership FAQ to help answer any questions.